Got lots of magazine-style content and need a stylish frame? 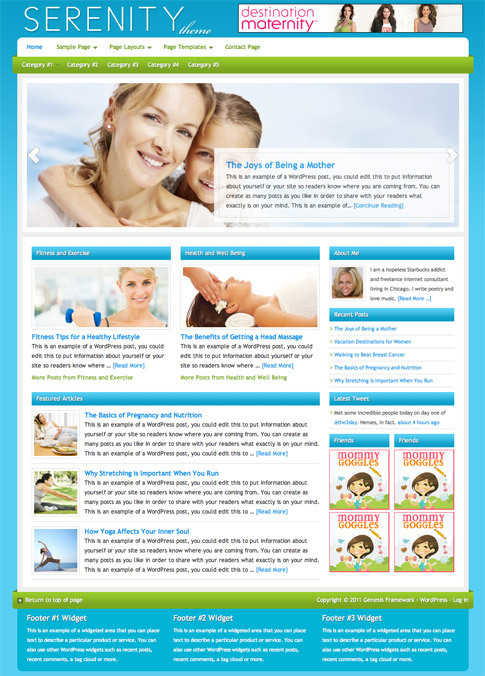 Serenity premium WordPress theme is a great choice for sites that have a lot to say. Choose from an amazing selection of widgets that support everything from video to in-depth articles. Serenity premium theme is also built on the Genesis Framework, which helps keep your search engine rankings from falling when you make large updates to your code. StudioPress offers tons of functionality for a very reasonable price. Make sure to check out Serenity theme at the end of this post! Come back and check out the showcase as we find more sites from around the web using Serenity.